I am building a simple buck converter to regulate a 5V form my 9.6V battery. The battery is a pack of 3 18650 cells (3S) and the output is supposed to power my MCU (PIC) a couple of sensors and a servo motor. So far I have decided to use the IRFZ44N MOSFET as a switch and the controller will be an Arduino so make things easy for my first run. Can some one please explain me how to calculate the value Inductor? A direct formulae will be more helpful. 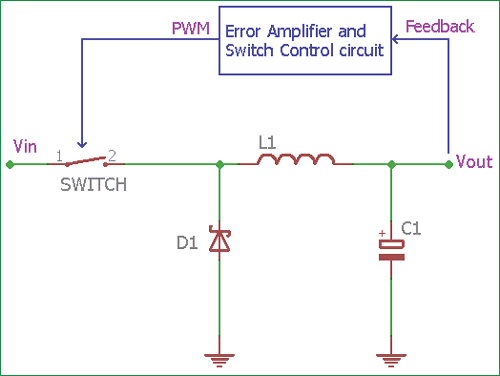 Most converters operate in the CCM mode, but to keep calculations simple people normally calculate the Inductor value for BCM. This Inductor value is called the Critical Inductor Value. Once we get this Critical inductor value we can slightly increase it to work in CCM mode ot decrease it to operate in the DCM mode based on the required ripple voltage. This formula will help you in calculating the value of Inductor in Henry, it gives a rough figure, but it should work fine for your application. Here Vi is the Input Voltage, Vo is the Output Voltage <io> is the average current through your load and DT is the switching frequency of your MOSFET in ton/ton+toff. Thanks for the reply john. But I am still confused here on how to find the value of <io>. You have mentioned <io> to be average load current, my load should not consume anywhere more than 1A so is my <io> just equal to 1? Also the value of my input voltage Vi and duty cycle DT is not fixed how to I substitute these values in the formulae ? Yes Raj, since your load comprises only of digital IC's and sensors you need not worry much about the peak or ripple current. Assuming it to be 1A will work fine. The value of Vi and DT are variable as you said, you can calculate the L value for minimum and maximum value of Vi. DT is controlled through program. If you PWM can be from 0% to 100% then you can play with the formulae in such a way that for all values of Vi you should be able to get the desired output voltage Vo for your value of L by simply varying the duty cycle. 100uH is my required value, now where to buy them? Hi, that did clear up my doubts. I roughly approximated my inductor value to be 100uH, with this value of L I should be able to get a constant 5V by varing by duty cycle between 40% to 90% for an input voltage varying from 7V to 13V. Now I where to buy this 100uH, is it a good idea to find my own inductor I have a toroid core with me. My local electronics shop only has color ring type inductors which I thin is not suitable for this circuit.